The latest e-reader coming soon to the market claims to be the smallest and lightest around…and will cost just £100. The txtr beagle, currently only available in Germany, has a 5″ e-ink display, similar to that of the Amazon Kindle and the Kobo range and weighs just 128 grams. This offers possibilities on a number of levels and not just for authors. Because of their price and lightness and quite good looks they could be used as display models for things such as menus in restaurants as this is the first opportunity that businesses have had to buy e-readers at a truly affordable price. 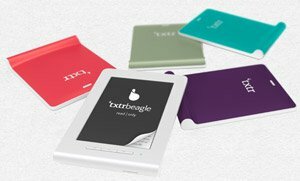 The txtr beagle does have its limitations; despite having 4GB of space, 2GB more than the Kindle and Kobo Touch, it will only hold 5 ebooks compared to the other devices suggested 2,000. This is possibly because of the image processing when the books are being sent via a smart phone application to the beagle as the beagle comes without wi-fi or 3G. However this is a small complaint for some and with a promised year of battery life, this little device could become a huge hit, especially with those not already convinced enough to pay upwards of Â 100 for a device. It might also end up being popular within the children’s market. The txtr beagle provides yet another reason to consider going digital with publications and books.